I guarantee that when all of the flavors and textures combine you’ll want to whip up a batch of this every weekend! The lightly roasted veggies are seasoned with smoky paprika and garlic, then covered in cheese and baked. 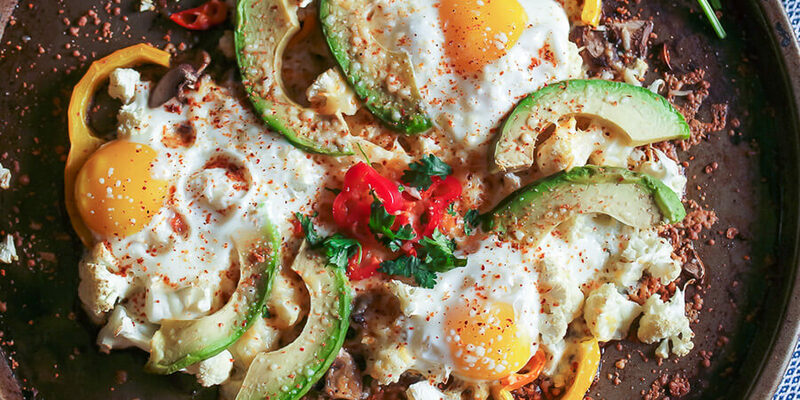 Once everything begins to melt, six slices of avocado, and eggs are baked to perfection. Top it off with classic Tajín seasoning, and cotija cheese, to give it a lightly spicy kick. If you aren’t familiar with Tajín seasoning, it’s a very popular seasoning used in Mexico. It’s made of chili pepper, desiccated lime, and salt. I love adding it to eggs for a light amount of heat and a little hint of lime. Pair that with the cotija cheese and it adds a creamy, salty, taste that will have you shaking it on everything! Cotija cheese is somewhat similar to feta cheese and can be found in large blocks at any Mexican market. You can also find an aged version that closely resembles the texture and taste of Parmesan cheese. This is often sold in plastic tubs and sometimes even Parmesan-like shakers. Aged cotija is preferred for this recipe. The term “spicy” may not apply to everyone’s taste buds with this dish but for me it is the perfect amount of spicy vs. cheesy with the refreshing hint of lime. If you need more heat, I’ve included the option for a few jalapeño slices, too! *You can reserve three half circle “strips” of pepper to use as a barrier for the egg on the edge of the veggie hash. It’s optional and helps hold the egg in place. 1. Heat oven to 400°F and line a round or rectangular baking sheet with foil. In an even layer spread diced zucchini, cauliflower, and red pepper then drizzle with oil. Dust on onion powder, garlic, and paprika then toss to coat. Smooth everything back into a single layer. 2. Bake for 10 to 15 minutes or until it begins to brown. 3. 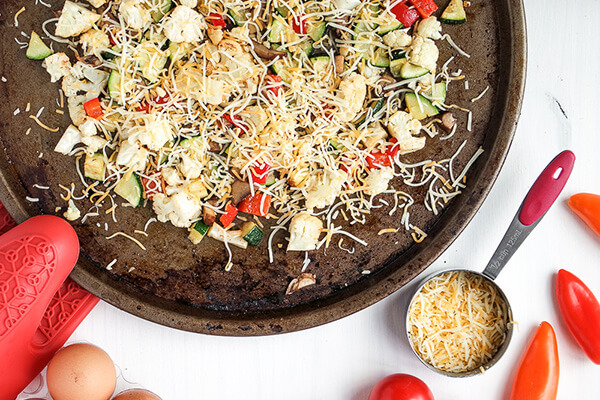 Remove the roasted vegetables from the oven and top with shredded Mexican blend cheese. 4. 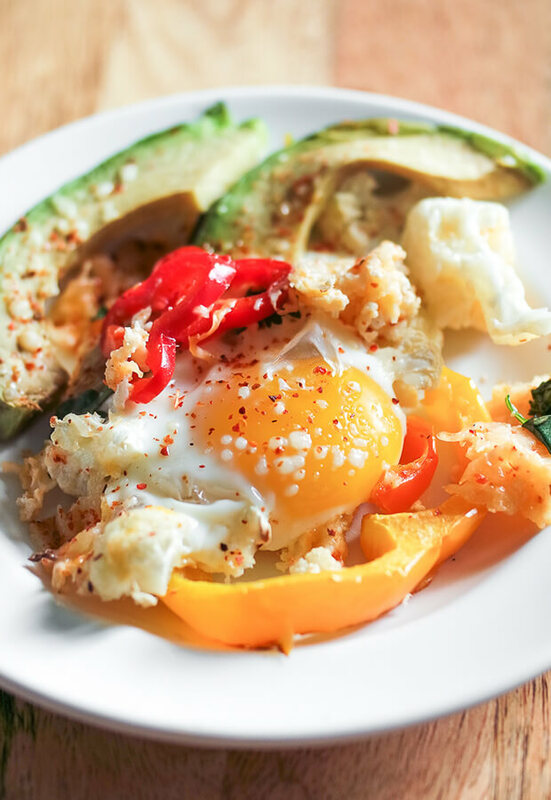 Arrange the sliced avocado around the veggies, and crack three eggs in the spaces between. Bake for about 10 minutes or until the eggs reach your preferred level of doneness! Top with cotija Cheese, optional jalapeños, and Tajín. This makes a total of 3 servings of Spicy Baked Eggs with Cheesy Hash. Each serving comes out to be 248 Calories, 18.14 g Fat, 5.77 g Net Carbs, and 12.57g Protein. This makes a total of 3 servings of Spicy Baked Eggs with Cheesy Hash. Each serving comes out to be 248Calories, 18.14 g Fat, 5.77 g Net Carbs, and 12.57g Protein. Heat oven to 400°F and line a round or rectangular baking sheet with foil. 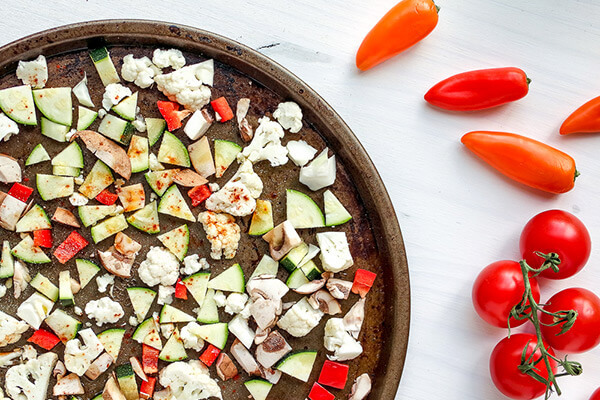 In an even layer spread diced zucchini, cauliflower, and red pepper then drizzle with oil. Dust on onion powder, garlic, and paprika then toss to coat. Smooth everything back into a single layer. Bake for 10 to 15 minutes or until it begins to brown. 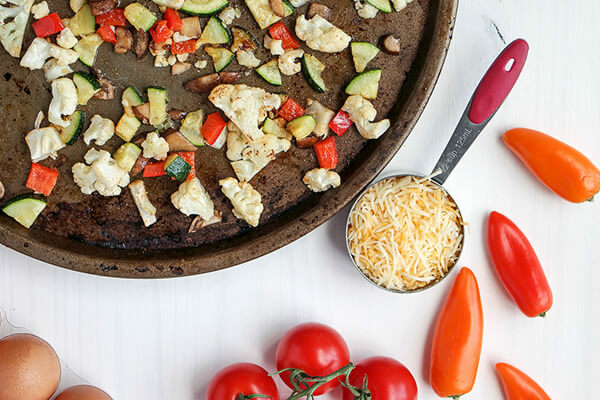 Remove the roasted vegetables from the oven and top with shredded Mexican blend cheese. 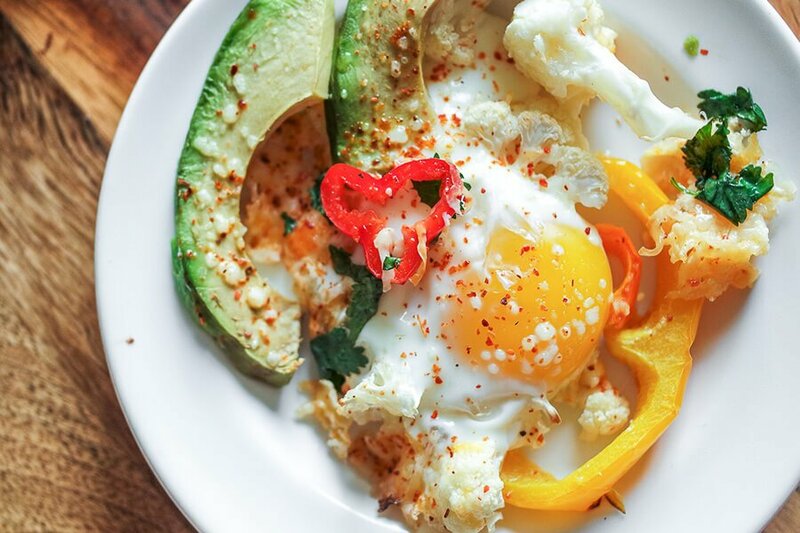 Arrange the sliced avocado around the veggies, and crack three eggs in the spaces between. Bake for about 10 minutes or until the eggs reach your preferred level of doneness! Top with cotija Cheese, optional jalapeños, and Tajín.